More Than Just Dry Cleaning. Argyle of Camden Dry Cleaners has been in operation for over 30 years. Now owned and run by Helen and Jeff for the past 8 years, Argyle Dry Cleaning provides in-house services including, dry cleaning, ironing, alterations and key cutting. Never have time to get to the dry cleaners? No worries. 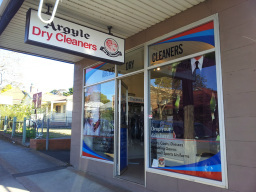 Argyle Dry Cleaners provide a local mobile service to many areas in the Macarthur Wollondilly area. That means there is a collection point in your local area so there will be no need for you to divert on you trip to or from work. Find the collection point nearest to you on our "Collection Centres" page. Don't forget to "Drop ya daks" at Argyle Dry Cleaners!!! Congratulations on your engagement!!! Your wedding day may very well be the best day of your life. The last thing you will want to worry about is how you are going to get those stains out of your beautiful white dress. Lets face it if you want those amazing photos you'll be getting down and dirty in that expensive wedding gown, but it is a small price to pay. Let us at Argyle Dry Cleaners ease your concern. We provide a wedding gown service for those brides bold enough to go beyond the call of duty for their perfect wedding day snaps. 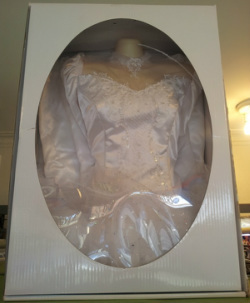 We'll even box it up for you so you can store it or display your dress as you please.